Technically speaking, we bring everything! No need to furnish tables, chairs, etc. as we come self contained and fully equipped with our own sound system, staging, even lighting! Shows can be performed outdoors (for festivals, etc.) and all that is ever really needed is a common electrical outlet and flat, level performance area as described in the diagrams below. The dimensions do have some flexibility. However, it would be best to achieve the dimensions as described in the diagram. Care should be taken to have the audience seated at least 7 ft. away from the actual performance area and not right on top of the stage. Use this diagram as a aid when determining how the performance will fit in your intended venue. If it appears that there is some difficulty for your intended venue to accommodate the dimensions of the performance areas requested, please contact us and, together, we can come to a solution to any challenge. We bring all sound equipment needed (and lights, too!) as well as a small show stage. As you can see, the performance of the puppets occurs "at knee level". The show stage will raise the performance 22 inches above floor level, but sightlines for the audience will benefit if the show can be staged on a raised platform (or stage) provided by the venue that will accomodate the 14 ft. X 10 ft. dimensions described. 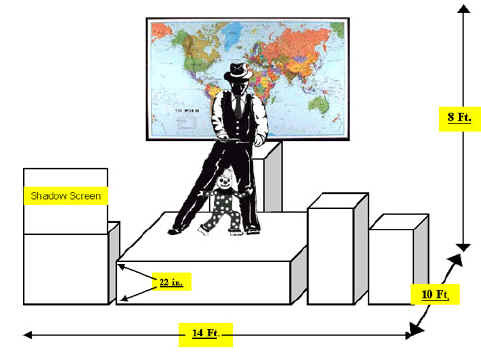 Below are diagrams for audience seating arrangements. We are called upon to perform at a variety of venues -- cafeteria stages, gymnasiums, libraries, school activity rooms, outdoor festivals, and proper theatrical stages to name a few. We have designed this show to meet with all the challenges these types of venues pose. Audience sightlines and seating arrangements should be a big consideration for the proper enjoyment of the performance by everyone in the audience. The diagrams presented will give a better understanding of different types of audience seating. 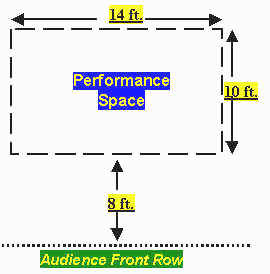 The diagram shows how audience sightlines can be improved if the performance is presented on a raised platform - stage provided by the venue. Bleacher seating provides good sightline visibility for all members of the audience.